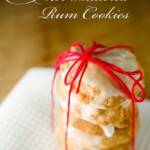 These hot buttered rum cookies taste like simple spice cookies, but instead of using vanilla extract, their flavored is enriched with spiced rum. 1 tablespoon + 1 teaspoon whole milk If you want a stronger rum flavor, add another teaspoon of rum and remove the extra teaspoon of milk. In a small mixing bowl, mix flour, baking soda, cinnamon, nutmeg, cloves, and salt. In a medium-sized mixing bowl, mix butter, sugar, and brown sugar until fully combined. Mix together egg and rum in a small bowl and then mix into the butter/sugar mixture. Add flour mixture to wet ingredients and mix until just combined. Drop tablespoon (or any size you'd like) balls of dough onto a parchment- or Silpat-lined cookie sheet. Be sure to leave a little space around the balls for them to expand while baking. Bake for 14 minutes or until cookies have puffed up but are dry on top. Wait for cookies to cool slightly before removing from the cookie sheet. If you remove them too early, they won't come off cleanly. Mix all ingredients and spread or drizzle over cookies. The glaze will harden after a few minutes.